It’s 1932 in Sydney: The Harbour Bridge is almost complete after nine years and the whole country continues to struggle with the economic disaster of the previous decade. But for well-heeled Sydney lawyer and ex-WWI officer Eric Campbell, the biggest peril of the Great Depression was not mass unemployment or starvation: It was NSW premier Jack Lang—aka the ALP’s “Red Wrecker”—and his dangerously socialist platform. As Sydney enters a long hot summer, Campbell starts to plot how he and the New Guard can take Jack Lang out of the picture for good. This is a tale of passion and politics in a time of global financial crisis. 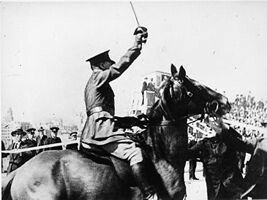 The rise and fall of Eric Campbell’s New Guard: the fascist army that gatecrashed the opening of the Sydney Harbour Bridge and plotted to overthrow the NSW premier in a military coup.